These Mini Frittatas will be perfect at your next brunch or even for breakfast tomorrow. Or my personal favorite, breakfast for dinner! Frittata. I’m not even kidding you, every time I spell this stupid word I have to look it up. Frittata or Fritatta. They both look good, right? My WordPress spellchecker doesn’t like either one of them, so maybe we should just throw them both out. But my WordPress spellchecker also doesn’t like “buttercream” so we don’t want to go throwing things out all willy-nilly. You’re right, WordPress. It is pretty irritating. 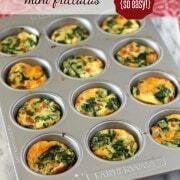 These mini frittatas are so flavorful, so fun and so easy to make! Even my daughter who hates scrambled eggs ate these fun egg cups. She loves spinach lately, so maybe that was a factor. I can’t wait to use this recipe for a fun brunch or maybe even for breakfast tomorrow. I used half egg whites to lighten these up a bit and add a great fluffy texture. You wouldn’t even know it. 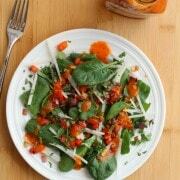 They have so much flavor from the vegetables and the help of a little sharp cheddar. If cheddar isn’t your thing (umm…we need to talk)…you could substitute with other cheeses. I think feta or Parmesan would be a great twist. You can also easily customize these based on what you have in your fridge or what vegetables you like. 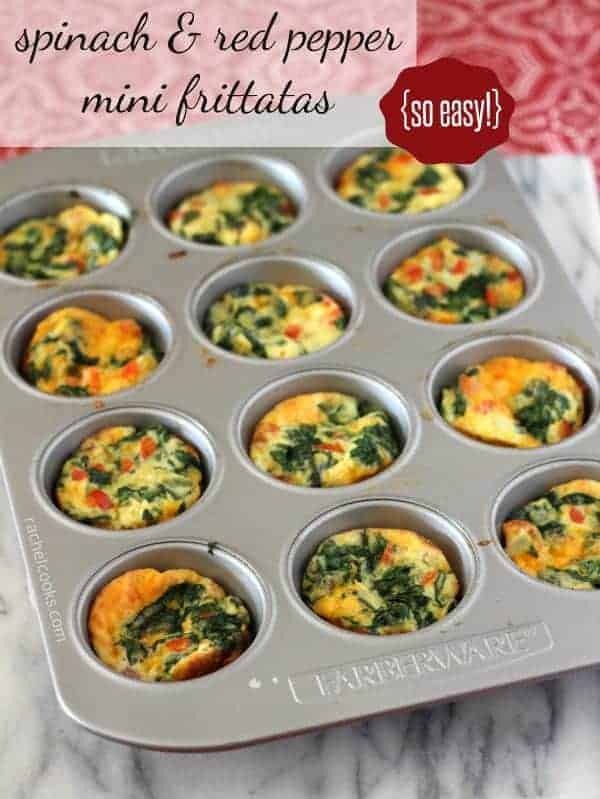 You could even do a few different flavors in one muffin tray to satisfy any picky eaters in your family. Preheat oven to 375 degrees F. Grease or spray a tin for 12 muffins. In a medium frying pan, heat the oil over medium high heat. When hot, throw in peppers and onions and saute until softened, about five minutes, stirring occasionally. Add spinach and stir gently until wilted. Remove from heat. Meanwhile, in a large bowl, whisk together eggs, egg whites, skim milk, cheese, salt and pepper. Pour egg mixture into prepared muffin tin so that each one is about 1/2 to 2/3 full. 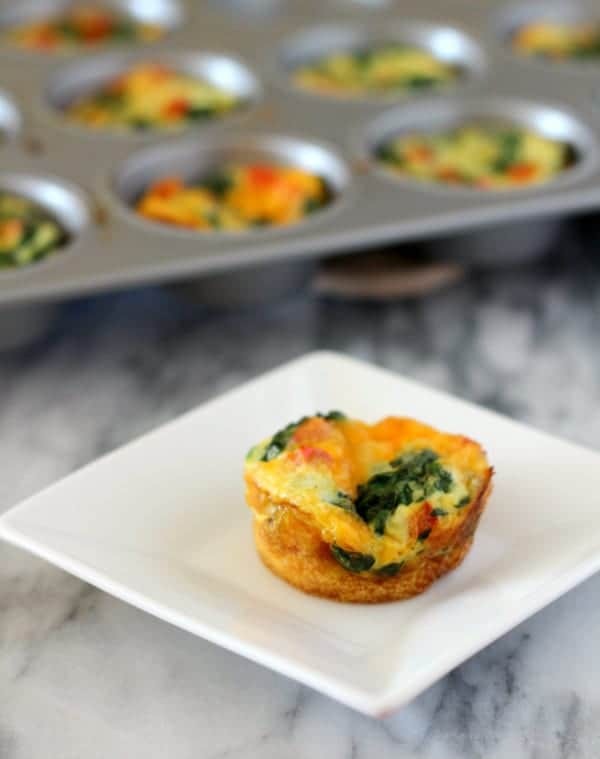 Add sauteed vegetables evenly to each of the 12 muffins. Bake for 20-25 minutes or until puffed up and golden brown. Leave in muffin tin for about 5 minutes before removing and serving. Verdict: We all loved these and I’ll definitely be making them again. Changes I would make: None are necessary, but like I mentioned, it would be fun to play with different flavors. 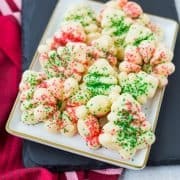 Very easy to make and the whole family liked them. I did add a couple more eggs to it and it still turned out! Regular size muffins! Thanks for asking! My first time making a frittata and it turned out great. I used a little too much salt, which I don’t recommend, but it was easy and flavorful. in your recipe mini frattias is it a total of 4eggs plus 4 egg whites I’m not sure .im confused or just 4 eggs? Can these be made in advance for a brunch and if so, how do you reheat? They should be fine made a day in advance. I’d reheat briefly in the oven on a baking sheet, just until warm. Love this idea! It would be great for a special brunch, varying the vegetables and cheese. 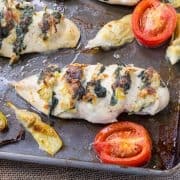 How do you suggest on freezing and thawing? These look awesome! I have made similar ones and put them in cupcake holders so they were easy to grab in the morning. I have to try your flavor combo! I’m always confused with the spelling, too! These look delicious – and adorable! Let’s hope there are not really any people who would say Cheddar isn’t their thing. And for the record I certainly can’t spell “frittata” either. Love these lil’ bites. My daughters would scarf them down too. These look great…. thinking they would be so easy to make for guests…. but also for busy school days. A batch of these could send my kids and hubby off with a great breakfast! Very fun idea. 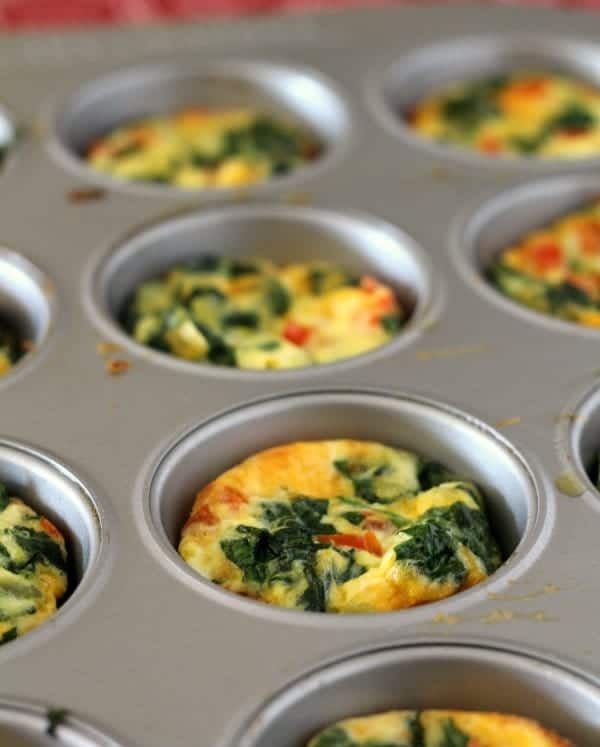 A muffin pan is brilliant for mini frittatas. Love this! Frittata may be hard to spell, but it’s so much fun to say! I’m kind of a word nerd, and this is one of my favorite to say (for no good reason at random times). Frittata!! I love Brunch foods! These look so tasty good! Lol. I have words like that. But I’d be too busy eating these to care how they’re spelled! I love making frittatas. I made some in muffin tins last week with frozen hashbrowns mixed in. I’ll have to try with red peppers! I’m happy to hear I’m not the only one that has to look up the word frittata every time I spell it. I just got down worcestershire, and that took me ages. These mini egg cups look delish.